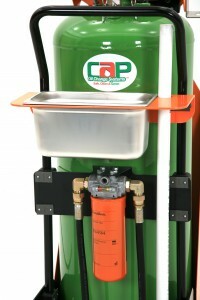 The OD-28 Oil-Fluid Dispenser is a 28 gallon unit that has capacity of filling itself by inducing a vacuum and "sucking” the new oil or other fluid into it. Once the unit has been filled, it is pressurized with compressed air for driving the fluid out. The fluid is driven out under the same pressure as the air pressure applied to it. The fluid exits through an appropriate filter and is controlled by one of several types of oil metering or shutoff valve. Like its sister product, the TT-28, this unit is portable, fast, prevents spills and is completely safe. There is no electrical hookup and thus no electrical hazards. The unit is operated entirely by compressed air. The unit will flow 6-15 quarts per minute (varies with viscosity and applied pressure). The unit can use synthetic or stainless steel wire mesh filters. These filters are compatible with motor oils, automatic transmission fluids, anti-freeze, hydraulic oils, etc. A seven level float switch and LED display indicates when the fluid in the tank reaches empty, ten percent, twenty percent, forty percent, sixty percent, eighty percent and full along with an alarm that warns the operator when tank is 8 quarts from being full.